There is something deeply satisfying about parades. The anticipation among crowds of people standing hip to hip with children delicately propped on broad shoulders, all eager to hear the very first beat of the drum resonating inside their chests. I love seeing eyes grow wide as saucers as brightly colored faces beam smiles of excitement as each member of the parade takes on a persona they can only embody once throughout the year. Parades bring out a raw energy, an intensity that pulses throughout the crowd, because no matter how many times you see a parade, there is always an element of the unknown. 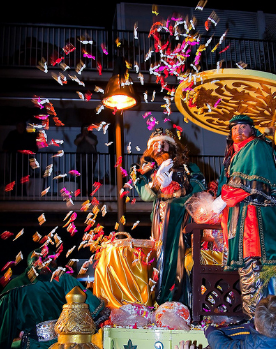 Last night, Ryan and I ventured out to our quiet streets of Terrassa to take in our first La Cabalgata de Reyes Magos. Having spent the last three holidays abroad in either the States or Norway, we’ve missed the festivities and felt that time had finally come for us to bundle up tight against the frigid wind and embrace the biggest night of the Spanish New Year: the celebration of when the 3 Kings – Melchor, Gaspar, and Baltasar – arrive into town with their entourage of pages to bring gifts of gold, frankincense and myrrh to Jesus. And although I am not a religious person, the idea of joining the community together in celebration is always appealing to me. I love when barrios pool their funds and resources together for the benefit of their citizens, so that everyone may find a ounce of hope and joy, and god forbid, imagination in their day. But what I failed to grasp, watching cold little mittened hands hold out their knitted caps like nets was the barrage of brightly colored hard candy being thrown by the bucketful at the crowd. While minding your own business, you’re suddenly pegged with hundreds of hard candy from each and every passing float. And we’re not talking, “here’s some candy little one”, with hands held out in gentle acceptance. Nope, we’re talking full on machine gun raid of candy hitting you like a rain of hail. This year, Barcelona spent 400,000 euros to create a caravan consisting of 350 artists, 70 technicians, 310 students from the music and dance schools to travel a 650 meter route throughout the city throwing…..15,000 kilos of candy. And if this isn’t mind boggling enough, Madrid spent 950,000 euros, 350,000 less than last year as a result of the recession, contracting 257 cleaning machines and 300 employees to clean up the piles of hard candy smashed into the pavement. Ahhh, but that’s not all, not only do you have welts from sky falling candy, making you sorely wish you had brought goggles and helmet, but you also have a nice long line of camel, elephant and horse poop to complete the adventure. But does that disway parade goers of vacuuming up the city with a desire to collect as much candy as humanly possible? Not a chance! The only places where you actually see candy is where they have been laid to rest by smashing animal hooves, car tires or stampeding feet. Whatever else looks relatively edible is quickly swiped up by grandparents, parents and children alike into heavy plastic sacks of loot. If I were a candy girl, I swear this would be my favorite day of the year! For those of you viewing the photos or Youtube video link of the parade, you may be a little curious why 1/3 of the caravan is painted in black faces. As Americans, we can tell you that this moment was a little disturbing (history of Black Face), despite the gaiety of the celebration. As legend has it, Rey Baltasar was of Egyptian descent, making his entourage of similar origin. Now, as many Spaniards have much lighter skin, they can either ask for volunteers among the hundreds of thousands of Africans, or Middle Easterners, who are hanging out in Spain to take the part, or they can paint their skin dark. And although I realize that no harmful intentions were displayed in their costuming, it does make me wonder why they wouldn’t want to invite their southern brethren to join in the festivities? Then again, maybe they did extend the invitation, but there were no takers – doubtful but possible. The rest of the celebration consists of kids running back home, laying out their shoes (no stockings) on the window pane where the kings will magically teleport themselves through the window with their camels and fill up their shoes with small gifts. I trust the smart kids have collected Dad’s moonboots from the back mudroom in desperate hope that size will matter. Then, so as not to piss off the kings, children lay a leaf on the table under a bottle of cava and Turrón (traditional almond dessert), followed by a bowl of water and fruit peelings for the camel. The issue comes to my mind, however, which Cava do you give the Three Kings, and how agile are they to get through your window after drinking the 2,345,000 bottle. So there you have it, La Cabalgata de Reyes Magos and El Dia del Reyes, two traditions that have afforded us even more holiday time in Spain. Lucky us! 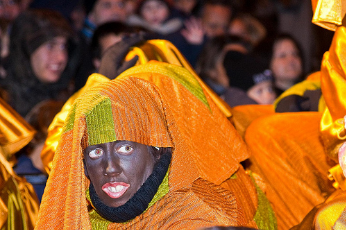 For more photos of La Cabalgata de Reyes Magos, check out Ryan’s photos here.